In 1938, former IHC Block Men Carl T. Sr. and Fred J. Roedel opened their own IH truck dealership in Kirkwood, MO. by refurbishing used trucks, selling parts and servicing vehicles in the Saint Louis, Missouri and southern Illinois market. 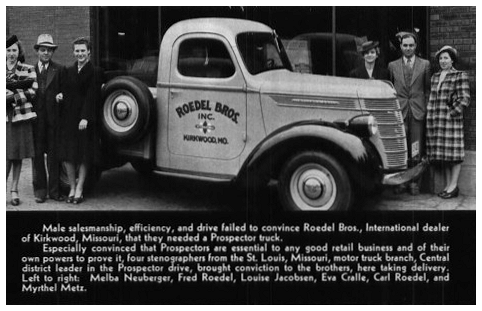 Before long, the Roedel Brothers became one of the largest volume dealers in the International Harvester network - selling more than 400 trucks a year! Today, that passion and dedication to the International light truck brand continues. Roedel Brothers, LLC is an authorized Scout//Lightline dealer. We specialize in these iconic vehicles and have a full inventory of new, used, NOS and aftermarket parts for your International Scout, Travelall, pickup and light truck. So whether you're doing a frame off restoration, building a weekend toy or performing routine maintenance or upgrades to your daily driver - we have the parts and expertise to help you. OEM Replacement Window Regulators for 1971-80 Scout II, Traveler and Terra.